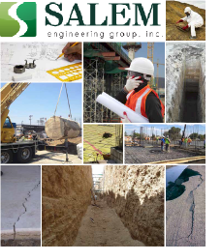 Environmental Consulting – Salem Engineering Group Inc.
Our clients trust SALEM Engineering Group, Inc. to provide highly responsive value engineering solutions to complex environmental challenges often encountered during real estate transactions and site development activities. SALEM Engineering Group, Inc. understands the potential risks associated with acquiring contaminated properties and recognizes the importance of assessing the risk during the site acquisition process in order to allow our clients to make well informed decisions. Our nationwide network of registered professionals is able to help quantify and clarify a wide variety of environmental issues that could affect your site. SALEM Engineering Group, Inc.’s local experience, quality service, and client focus will help provide cost-effective solutions to your environmental issues. SALEM Engineering Group, Inc.’s understanding of the real estate due diligence process optimizes our client’s gains in acquiring marketable properties while minimizing risks associated with the liability of remediating contaminated property, thus assuring maximum return on investment. SALEM Engineering Group, Inc.’s team of certified environmental professionals has provided environmental consulting services for a diverse base of clients, including large-box retail store chains, major financial institutions, private investors and entrepreneurs, municipal districts, state and federal agencies, redevelopment agencies, medical facilities, institutions and correctional facilities, canals and irrigation waterways, single- and multi-family residential buildings and tracts, real estate developers and land owners, design professionals, among others. Each team member brings a specialized level of experience and expertise to their work, resulting in a cohesive approach to project management and successful project delivery.